If the thought of sitting for exams makes you nervous, don’t be! 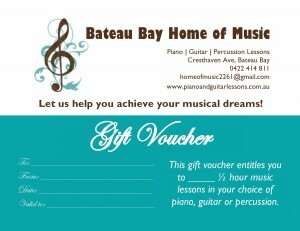 At Bateau Bay Home of Music, we offer and encourage all our students to sit for graded exams through the Australian Music Examination Board (AMEB). Why? The benefits are huge! * Satisfaction: Sitting for exams gives you a sense of satisfaction and achievement that you have reached a musical benchmark. * Measure Your Progress: Sitting for exams are a fun, challenging and structured way to measure your musical progress. With each grade you pass, you know you are getting better and better. Start at Preliminary grade and move your way up through to 8th grade and beyond! * Range of Styles: Exams are a great way to introduce you to a diverse range of musical styles and genres from classical to blues, popular to ragtime. * Good Technique: Exams encourage good technique and sight reading as well as developing your listening and aural skills. * Recognised Achievement: AMEB exams provide a recognised standard of achievement at all Universities, TAFEs and Colleges. All exams are performed before a qualified and experienced examiner in a relaxed environment and at the end you receive a report with a mark and a certificate. What Exam Courses are Offered? Ask us how you can sit for exams!